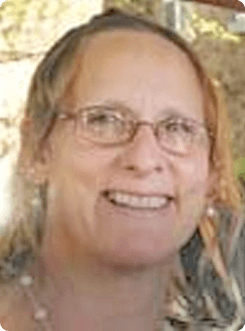 Cynthia Ann Miller entered into rest November 24, 2018. Born January 6, 1961, she is the daughter of Peggy (Kerr) Phillips and the late Gerald Phillips. Cynthia enjoyed time with her family, riding the motorcycle with her husband and crocheting. Beloved wife of Dennis Miller; beloved mother of Benjamin, Eric, Sara, and Angela Miller; cherished grandmother of Lexi, Lana, Dakota and Lucas; dear sister of Paul Phillips, Sue (Scott) Brauen, Pam Holmberg, Scott Phillips and Stacy Hatcher. Friends may call from 4-7 PM on Thursday at the Taylor and Reynolds Funeral Home, 70 Niagara Street, where the Funeral service will be held at 7:00 PM. Condolences may be offered below, and flowers may be purchased through The Flower Barn.